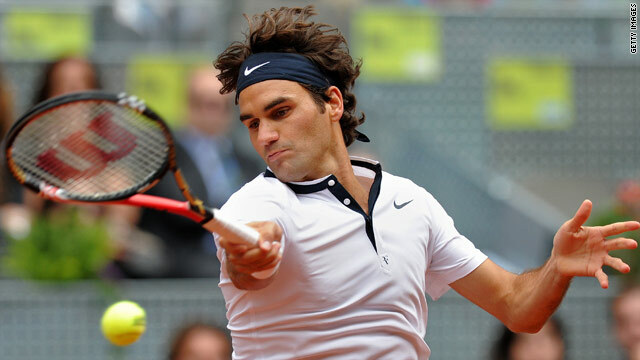 Roger Federer beat Benjamin Becker to secure a place in the third round of the Madrid Masters. (CNN) -- Roger Federer has begun his defense of the Madrid Masters with a second round victory over Germany's Benjamin Becker. Top seed Federer took just 81 minutes to record a 6-2 7-6 (7-4) victory over the world number 46. Federer -- who was knocked out of the semifinal of the Estoril Open by Alberto Montanes last week -- secured a service break in the first game of the match and another in the eighth to take the opening set. Becker battled hard in the second set, saving two match points with the score at 6-5, before going down in a tie break. Federer will now face either Stanislas Wawrinka, who beat Spain's Marcel Granollers 6-4 6-4, or Argentina's Leonardo Mayer as he bids to reach his first final since clinching the Australian Open back in January. Elsewhere, Juan Ignacio Chela booked a Wednesday date with world number four Andy Murray after his opponent Pablo Cuevas retired early in their match. Latvia's Ernests Gulbis beat Federer's conqueror in Estoril, Albert Montanes of Spain, 7-5 6-1, while Cypriot Marcos Baghdatis recorded a 6-3 6-4 win over Marco Chiudinelli.